The given route is one of the most popular routes for many tourists wishing to begin their ascent into the mountains from the northwestern part of Ukrainian Carpathians. The mountain Polonyna Runa top represents the plateau of a huge size, covered with bushes of a bilberry, a cowberry, lichens and an undersized mountain pine. Half of the route passes on woody slopes. At the top the remains of the former military object – radar station of distant observation can be found. In the same place memorials in honor of participants of guerrilla movement in the Second World War are established . To the top the ferro-concrete road is laid, allowing to reach it even by car. However, our route represents a foot version of the ascent , which is described in some old guidebooks. The given route starts from the tourist centre “Polonyna” located at the end of the village Lumshory, Perechyn district. The tourist centre can be reached by a shuttle bus Perechyn-Lumshory. From the village it is necessary to walk no more than a kilometre by the road leading to a tourist centre, in the direction of the Northeast. The tourist centre can be reached as follows. From Uzhgorod we will drive away on a loop road of M 06 and Е 50, we will turn to road T 14 03 which leads to settlenent Perechyn. 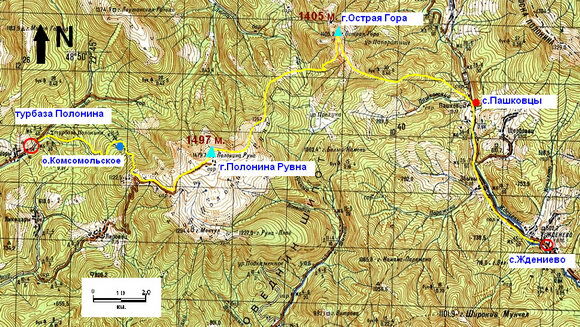 In Perechyn we take road T 07 12 in the direction of the settlement of Polyana. On the 8th kilometer, in the village of Turja-Remeta, we will turn aside to the villages of Turichky, Lumshory, road T 07 23. Further on 7th kilometre from the turn we will leave to the left, to the village of Lumshory. From the side of Lviv, Mukachevo it is necessary to go to the settlement Polyana, which is near to Svalyava, and in the settlement centre to turn under by the index – Perechyn. There is enough place for parking the car in the tourist centre. The track to polonyba starts right behind camp. We pass to the left bank of a stream by a suspended bridge, we bend around a wooden building and we move in a southern direction (189 °). The ascent begins at once. After 0.5 km. we cross a small platform with abandoned bases of the buildings and turn to the left at the rate of 88 °. Having passed 150 meters we leave for a wood road and we continue movement to the South. Having made a small zigzag, we continue movement in the western direction (hardly more than 700 meters). Further the road turns to the South, crosses the small wooden bridge and changes a direction to southeast (134 °). Having passed 300 meters from the bridge, we leave for the first glade (650 m. o.s.l.). The following 370 meters we pass at the rate of 65 °, in the direction of the East, then 490m. at the rate of 161 °, then 650 m. in the direction of the North (29 °). Soon the wood road leaves for a large glade in the bottom of which a small lake lies (839 m. a. s. l.) . Not so long before the lake has received the name Komsmolske Lake. In this place many tourists make a break , stop for the night, arrange summer camp. At a southern part of the glade some buildings for tourists have been constructed : a small wooden house, floorings for tents, tables. Here nearby there is a spring where it is possible to fill up water-supplies. 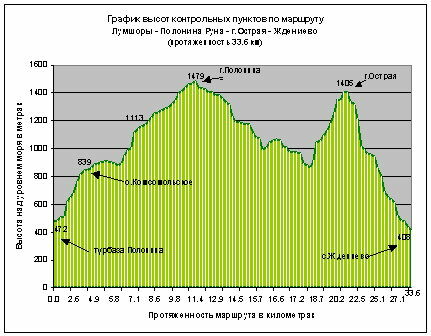 From here to the top of mountain Polonina Runa it is 7.1 kilometres and about 3 hours of walk. Difference of heights makes 640 metres. We will continue our travel. From lake, by a boulder, the track leaves first to the South (186 °), after 0.6 km. crosses a stream, and after 0.4 km. leaves for the large open field. Having passed by a field road in a southern direction 650 meters to a road fork, we turn to the left to the North- East and further we move at the rate of 22 °-25 °. 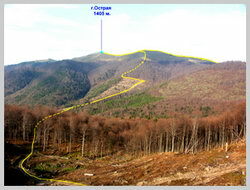 From a fork to the beginning of a plateau of mountain Polonyna Runa it is necessary to rise 220 meters and to pass 1.24 km. Ruins of buildings and the remains of the ferro-concrete bases will be the first objects on polonyna which tourists meet. We pass 300 metres to a concrete highway. Further this concrete road leaves to the South, then to the Northeast and in the end it leads us to almost top point of the mountain Polonyna Runa. Here, at the top, you will meet huge ruins of the former strategic objects. It can take hours to get acquainted with the rests of iron and concrete. However, it is much more pleasant to admire boundless panoramas of open spaces of valleys, gorges, mountain ridges, dispersing extensively into the horizon. In the north the tops of mountains Ostra (1,405 m.) are visible, more to the right from it Pikuj (1,406 m.) In the east the reserve Shipot stretches. In the south Turyanska Valley lies. In the Northwest, on the distance of “outstretched arm”, two tops Small Golytsa (1,183 m.) and Lutanska Golytsa (1,374 m.) lie. In the West in the distance, Slovak Beskids are visible. Our route proceeds to mountain Ostra in a direction of the North, distance to which is 9.2 km. We will use a track leaving from memorable granite stella to the East (86 °). After 1.1 km. the track passes in the mountain road which is going downwards to the North. On the first fork in the roads we keep the northern direction.